Telluride Golf Club opens with a 377-yard, downhill par-4 that is temptingly drivable at altitude. Scoring opportunities abound as back-to-back par 3s follow, including the sporty 233-yard third hole (No. 4 handicap). As the front nine progresses, famed Wilson Peak dominates the backdrop as golfers negotiate consecutive par 5s with the 635-yard eighth hole. The back nine ascends even deeper into the 14,000-plus peaks of the San Juan Mountains. Uphill holes, stout carries and beguiling doglegs add ample teeth to a strategic design that doesn’t rely on length as its only defense against par. The closing holes present a compelling contrast in brawn and beauty. The rapidly rising 486-yard par-4 15th – the course’s most difficult hole – plays like par 5. Conversely, players who climb the 92 steps to reach the tee box on the par-3 17th are rewarded with a 100-foot drop over 137 yards to a pine-encircled green below. Telluride Golf Club is an Audubon Cooperative Sanctuary, one of the first courses bestowed the prestigious certification in 2004. It meets strict criteria for water and biodiversity conservation, habitat protection, water quality management and reduced chemical use. Last year the club expanded its game improvement platform with an entire new 55,000 square foot golf practice facility. This includes a 350-yard long hitting area with three 100-yard wide tee boxes, plus a new chipping area and putting green of 7,900 square feet. In addition to limited daily-fee and resort play, platinum and silver memberships encompass golf, skiing, snowboarding, spa, fitness, dining and other amenities and exclusivities. Destination golfers can choose from a variety of first-class accommodations, including the critically acclaimed Inn at Lost Creek. Getting to Telluride has never been easier with direct flights from nine major U.S. hubs to Montrose-Telluride Regional Airport (MTJ). 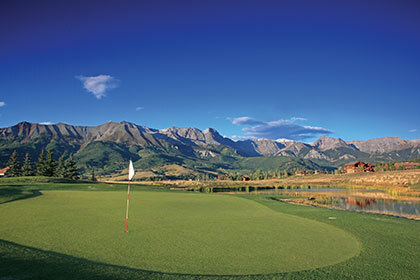 For more information about golfing in Telluride, please click here. 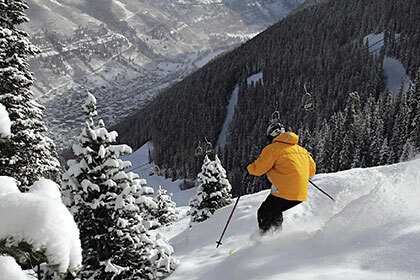 Telluride’s green circles, groomed blues and gourmet powder can be found at every turn. Overall, nearly 60% of our terrain is beginner or intermediate, but lift lines and crowded slopes seem like a million miles away. Visiting Telluride is all about going your own way, leaving the pack behind, and skiing a mecca few are lucky enough to enjoy. For more information, reservations and tee times: 800.778.8581, tellurideskiresort.com.